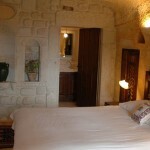 Cappadocia Elkep evi cave boutique hotel : You will find peace of mind to get rid of the stress of the city life,Elkep evi is an excellent address. 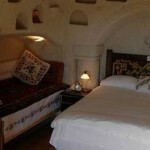 The area which hotel situated in Cappadocia region has been home to various civilizations for centuries. Smelling history and beauty in every step, with It’s famous fairy chimneys one of the important tourism center in the world. 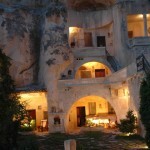 ELKEP EVi cave – boutique hotel gives you an egzotic feeling during the day and the night with it is naturel beauty it is a very special Cave Hotel where you will witness to the great harmony and the silence of nature. The Hotel rooms and breakfast garden are the most beautiful places to watch the spectacular views of cappadocia. 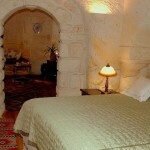 Elkep evi cave hotel in Cappadocia has standard cave rooms, honeymoon cave suite,suites in cave and rooms with hammam (Turkish Bath) and jacuzzi. 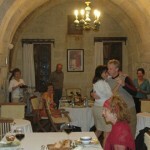 Delicious and fresh home-cooked meals in the hotel kitchen will add a special taste to your vacation,when you leave this unique boutique hotel you are going to make your future plan to come back again to this unique cappadocian cave hotel. Hotel rooms are en suite,with wood floors,central heating and direct dial telephone. Hotel services include daily breakfast and housekeeping. Laundry service, fax and internet access are available. Enjoy your daily breakfast and an unparalleled view of Cappadocia from the garden at Hilltop. The traditional Turkish breakfast includes home-made gozleme (a savoury Turkish pastry), olives, cheese, fresh bread, an assortment of jams, freshly squeezed orange juice and tea or coffee. Dinner can be served in the garden upon request.